Join Steve Henderson Fine Art October 26-28 — Friday through Sunday — at Ideeli.com for an online solo show of Steve’s paintings in the Home Department. Steve is proud and honored to be showcasing his art at Ideeli, one of America’s fastest growing retailers. Hope to see you there! Surrounded by red walls, the Emerald Pools of Zion National Park catch the last light of a summer day. Last Light in Zion — original oil on canvas — 30 x 30 — is one of three paintings by Steve Henderson accepted to the 6th Annual Paint the Parks Competition. Featuring the work of some of America’s top representationl painters, Paint the Parks celebrates the beauty of our country’s national park treasures. Shore Leave (original oil on canvas, 16 x 20, $1800) is presently at the Maritime Art Museum in Mystic Seaport, CT, accepted into the prestigious museum’s Modern Marine Masters Invitational, which opens April 29, 2012 and runs through June 17, 2012. You may purchase the work through the Maritime Art Museum by contacting gallery@mysticseaport.org or calling 860.572.5388. Limited Edition, Signed Prints of Shore Leave are available at the Steve Henderson Fine Art Gallery beginning at $55. We welcome correspondence and your questions at carolyn@stevehendersonfineart.com . It’s our goal to get fine art into the homes of real people. Incandescence, a glowing color-infused landscape of the American West, shows at Samarah Fine Art, Whitefish, MT, in conjunction with the gallery’s Invitational Autumn Miniature Show. The show opens Thursday, November 4, with fine artist Russell Chatham as guest artist. Three of the Norwegian Artist’s works, Cascadia, Evening Shadows, and Sunday Morning, were accepted into the Miniature Show and will be showcased through the holiday season. 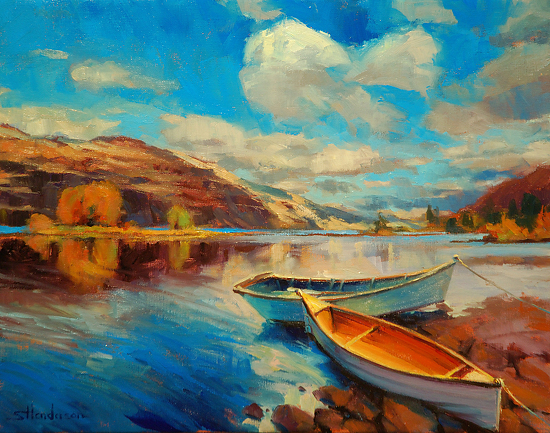 More artwork by the Norwegian Artist is available for view and sale at Steve Henderson Fine Art Online Gallery. 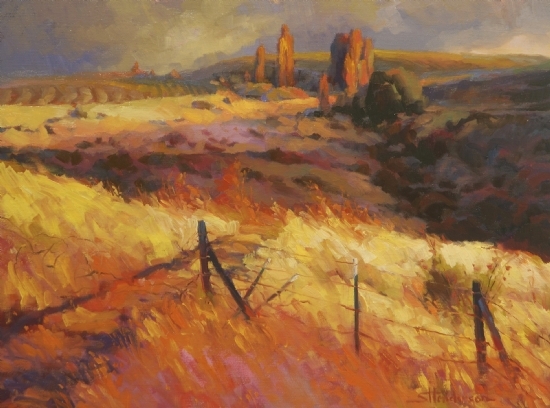 Steve’s work is also available at Rive Gauche Galleries, Scottsdale, AZ and The Lawrence Galleries, Sheridan and Gleneden Beach, OR. 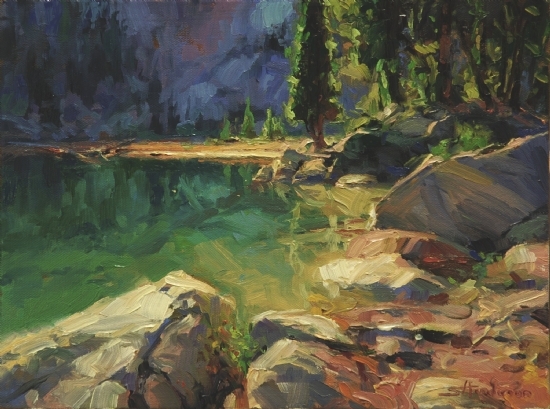 Sunday Morning, the Norwegian Artist’s original oil painting of an alpine lake of the Wallowa Mountains, OR, will be unpacked from its brown shipping box this afternoon at Samarah Fine Art, Whitefish, MT in preparation for the Invitational Autumn Miniature Show. The show, which features the smaller-sized work of premier artists, opens Thursday, November 4 at the gallery. Evening Shadows and Cascadia, also by the Norwegian Artist, are in the show as well. Incandescence, 18×24, will also be showing in the gallery. 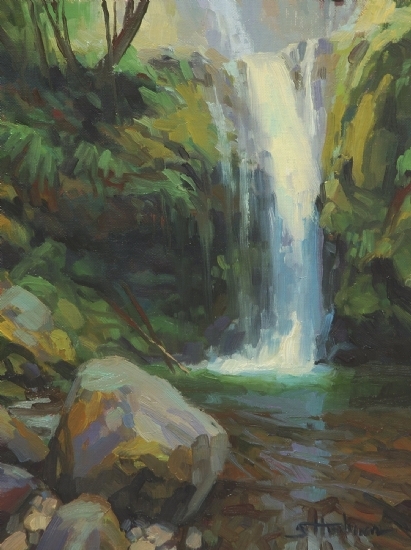 Cascadia, a miniature of an intimately hidden mountain waterfall, is one of four of the Norwegian Artist’s works heading over to Samarah Fine Art in Whitefish, MT. Accepted into the Autumn Invitational Miniature Show, Cascadia joins Evening Shadows and Sunday Morning for the November 4 opening of the show, which runs through the holidays and features Russell Chatham as the showcase artist for the opening cerimonies.